What does punk have to do with this weekend's protests? Among other things, this weekend's protests - like those in Seattle and the ones that followed - began in part in the garages and basements of America. Once again music ran ahead of politics - just as it did when Billie Holiday sang 'Strange Fruit' a decade before the civil rights movement. Just as it did when we gathered at the Mount Auburn 47 Club to hear a young singer named Joan Baez well before something called the Sixties. Just as we listened to Thelonius and Miles when there were hardly any verbal protests at all. In 1993, in a protest against censorship. Rage Against the Machine stood naked on stage for 15 minutes without singing or playing a note. 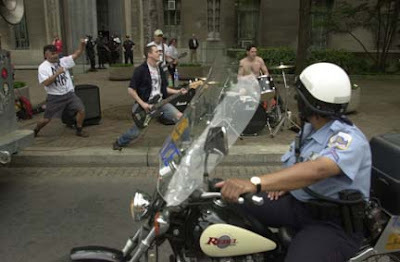 In 1997, well before most college students were paying any attention to the issue, Tom Morello was arrested during a protest against sweatshop labor. Rage Against the Machine sold more than seven million records before much of the rest of the country even got around to one little protest against the machine. I was a part of something they called the beat generation. Many of you are part of a beat, busted, bullied, and bamboozled generation. With the sole important exception of black Americans in the post-reconstruction era, no other generation has been so deprived of its constitutional rights and civil liberties. No other generation of young males has been sent to prison in such numbers for such minor offenses. And few generations of the young have been so consistently treated as a social problem rather than as a cause of joy and hope. And again - except for blacks in the post-reconstruction era - no other generation has been so deliberately cheated of so much. If you think I exaggerate, consider these figures from the Department of Labor, figures you won't see on the evening news, or read in the Washington Post. The earnings of everyone under 25 - black, white, latino, male and female - have actually declined over the past twenty years, about 5% for the most part. But get this: the earnings of black and white males under 25 are down 17 to 21%. A typical white male is earning $97 less a week in real dollars than 20 years ago. Roadblocks as part of random searches for drivers who have been drinking or using drugs. The extensive use of the military in civilian law enforcement, particularly in the war on drugs. The use of handcuffs on persons accused of minor offenses and moving violations. Jump-out squads that leap from police vehicles and search nearby citizens. Much greater use of wiretaps and other forms of electronic surveillance. Punishment before trial such as pre-trial detention and civil forfeiture of property. Punishment of those not directly involved in offenses, such as parents being held responsible for the actions of their children and bartenders being made to enforce drinking laws. Warrantless searches of persons and property before entering buildings, boarding planes, or using various public facilities. Closing of public buildings or parts of buildings to the public on security grounds. Increased restrictions on student speech, behavior, and clothing. Increased use of charges involving offenses allegedly committed after a person has been halted by a police officer, such as failure to obey a lawful order. Loss of control over how personal information is used by business companies. Warrantless searches and questioning of bus, train, and airline passengers. Random searches of school lockers. Random searches of cars in school parking lots. Video surveillance of sidewalks, parks and other public spaces. Involuntary drug testing increasingly used as a prerequisite for routine activities such as earning a livelihood or playing on a sports team. Steady erosion by the courts of protection against search and seizure. And, finally, persons 18 to 21 are routinely denied their constitutional rights by being banned from buying alcohol. As late as 1975, virtually every state had a drinking age of 18; now none does. But then we all have moved in many ways into a post-constitutional era. We all live in a culture that offers us not liberty but demands subservience, that does not foster the pursuit of happiness but rather relentlessly pursues citizens seeking only a decent job and a little happiness. Remember this weekend the words of another musician - Woody Guthrie - who sang that this land is your land and this land is my land. Don't let a bunch of cynical, corrupt and cruel bullies do any more damage to it than they already have.